Think you know this? Did anyone get it right? Betsy: Polly Pocket tongue depressors. Anne P: Weird snot hanging out of the Jolly Green Giant's nose, when he has an infection. Just Jaymie: A jellyfish lure. Maple girl: Snake necklaces for rebel brownies (Fae-folk). Amy: Somehow you have extracted the protein spirals of Ronald McDonald. Squarefeet: The worm gears from a Smurf's blueberry conveyor belt. Stella: Remember when you had to open a can of spam with a key on the side of a can, and it would peel off the metal around the can and it would wrap around the key? It's that! Dena: You unrolled the toilet paper tubes from your plastic Little Tykes doll's house. You'd been looking for a way to upcycle their trash, too. Ashley: There was once an evil alien, who loved those wonderful curly fries from Arbys. But to him they lacked a certain flavor...he tried all sorts of different sauces on them, and when none of them worked he was ready to give up and just force all life on earth to make the perfect sauce for him. But Mich, being so heroic, saved us all by taking the alien's beautiful curly fries, covered in different colored sauces, as part of a trade with the little ol' alien. She introduced him to ketchup. And the little alien went and bought a whole case, and he is now happily on the flight back to his home planet. Quite a few of you have used one at least once. Some of you use one every single day. 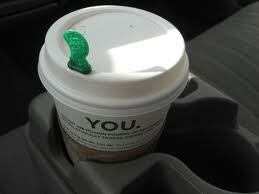 Starbucks 'splash sticks' - those green coffee stirrers that plug the holes in the to-go-cup lids. I painted 'em blue and gold to throw you off the scent...sneaky, sneaky. But they look very organic and tendril-like in their original green. That is definitely how I love them best! Starting with the big question: how did I get them to curl? No heat was used. I just held tight to one end, while twisting around a skewer. Cool, eh? Then snip snip with scissors or a wire cutter. Melt a hole with a heated skewer, and add a jump ring. And that's yer squiggly! Now you're all ready to add them to accessories or jewelry. Winners winners! I am giving the win to Dardrian, who was first to guess swizzle sticks. They do have a certain amount of swizzle, and that seems fair to me. And this week's random.org winner: Anonymous! (I can't wait to find out who Anonymous is - fortunately, she put her email in her comment.) Congrats to you both! Thanks for playing my favorite game, everybody. Sure was fun! Did I mention, I won this time? Let's see if I can get you next time. I feel like I might be on a roll. I still think you escaped from Willy Wonka's factory. I still think splash stick = coffee stirrer = swizzle stick. They all have the same purpose. Congrats to the lucky winner. YOU!!!! You got us again! I really like these ones Mich! They look fabulous! OMG I've been collecting those stirrers, thinking of an upcycle..maybe making earrings out of the tops by chopping off the very squIggles you made. Ingenious! I never thought of curling them. They would make really nice swirly earrings by chopping off the top instead like you did and then painting them (very sneaky.) I will try it! That's amazing! How you come up with ideas like this, I have no clue! Brilliant! They look so like tentacles! Love them! Are there also smaller stirrers / sticks / to-be-tentacles avaiable?